Sometimes, things are just too easy. 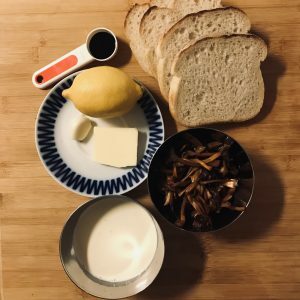 It’s fall, it’s mushroom season and the goodiest most wonderful mushroom toast is so simple to make, it’s… well it’s ridiculous. Cream, mushrooms, some soy and a nice piece of bread. We’ve always picked a lot of mushroom in my family. Chanterelles of different kinds, Porcini, maybe even the odd Russula? 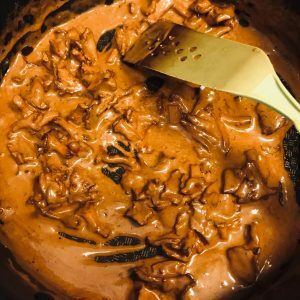 Through the years I’ve had different favorites for this recipe. The Yellowfoot is spicier and a bit more intense. Porcini is softer and more “forrest-y”. I really like Black chanterelle which also look incredibly cool. 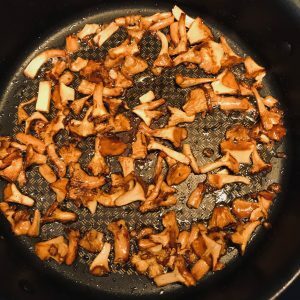 The one I make most often though, is the one with Yellow or Golden chanterelle, but you can’t really go wrong with any of them (pictures below sometimes show Yellowfoot and sometimes Yellow chanterelle). This is the best part because there’s really nothing to this recipe at all. It’s so so simple. Firstly let me just note that it’s a bit difficult to give a good weight estimate for chanterelles. Depending on the water content 150 g can be almost nothing (a couple of big mushrooms) or quite a lot. Look at the pictures below to get a gauge of what I used. Clean the mushroom. If they’re not very dirty, just brush them off. Otherwise rinse them with water. Some people say this is bad, I have no idea why. Maybe they confuse it with shrimp? Mushroom is a liiiiittle bit like the shellfish of the forrest? Chop the mushroom and fry them in butter on medium/high heat. Fry them until they sizzle, then we’ve gotten rid of all the excess water. Add finely chopped garlic and fry for another minute or two. Use as much as you want but I’d recommend about 1/3 of a clove. This is not supposed to be real garlic-y but rather just give some depth. Pour over the cream and add the soy. Again, add soy to your preference. I’d say 5 g (1 teaspoon/ 5 ml) is on the low end and 15 g (1 tablespoon/ 15 ml) is on the high end for me, meaning 15 g will give you quite a sharp taste of soy. I prefer to be at 5-10 g.
When the consistency is a bit more sauce-y then you want it, take the pan of the heat, add a squeeze of lemon, some pepper and salt (if you think it needs the salt). Then let it rest off the heat for 5 minutes. Toast the slices of bread in a toaster or in the oven. 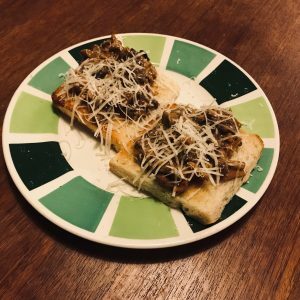 Put the mushroom “stew” on the toasted bread slices, garnish with cheese and you’re done! Maybe give them 5 minutes in the oven on grill, but this is very optional. For me, this is one of these dishes that are just the tastiest ever. There’s a bit of childhood nostalgia in that for sure. 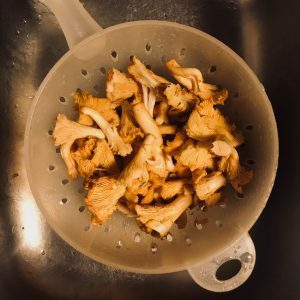 As I said, we really are a mushroom picking family and chanterelle toast was always the go-to thing after a walk in the forrest. However, that’s not all. 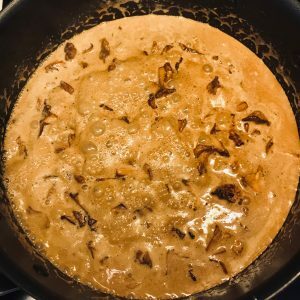 The combination of chanterelle, cream, soy and a hint of garlic and lemon is really something. And as a bonus it’s really nice to go mushroom picking.